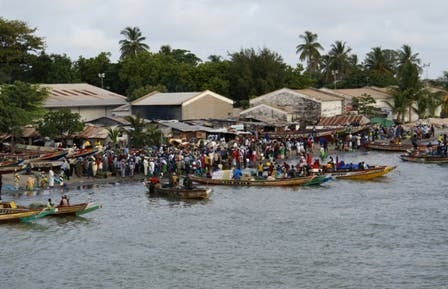 To get to Banjul, the capital of Gambia, you have to go a little to the north to catch a ferry across the mouth of the Gambia River to the city of Barra. The paths are continuous, but the large number of people moving makes this journey seem endless, not only when you're waiting for the barges, but because of the time it takes to cross to the other side of the river. The operator of this ferry is Gambia Public Transport Corporation, and it takes roughly 90 minutes to complete the journey. During the trip you can see all types of vehicles, pets, travelers and traders who go or come to the big city to sell their products.